Before this [present incarnation] the entity's activities were begun in a foreign land, and the entity was trained as a lawyer - or a justice of the law; yet with the experiences brought about during the American Revolution and the activities there, the entity came with Cosciusko into this land. The entity became closely associated with the leaders in the activities about Pennsylvania, Maryland, Michigan AND Virginia. Hence, as has been indicated, during the latter portion of the entity's sojourn the acquaintanceships were with those of the Lee home, those of Mount Vernon; for there the entity spent some time during the latter period of his sojourn in the earth, with the first President as well as the associates of those activities through that experience. Thus Washington, Adams, Jefferson, Jay, and all of those were associates or friends and acquaintances of the entity. The name then was Leonard Zolocoffa. In the experience the entity gained, though - as indicated - was hindered from carrying out its activities as a diplomatic agent. Yet the assistance given to the early activities of the various lands with the new land may be said to have come much because of the entity's counsel and suggestions during that experience. Hence in the present, train the entity in law - diplomatic law; that will have to deal with many countries, many problems, - not only political but social and religious. For, eventually the entity will see a religious war. [Emphasis added]. Because Mr. 2542 will be 63 years old in November, 2001, it seems just possible that the religious war mentioned could occur any day now. We begin, therefore, by trying to identify the probable protagonists in such a war. Background. The most dangerous war to affect the world will be a large-scale, several nation religious war centered in the Balkans. This is where three of the world's great religious cultures collide. The "western" Christians dominate Western Europe. The Moslem culture dominates regions to the south of Europe, and the Eastern Orthodox Christians dominate Eastern Europe. These three groups come together - like restless tectonic plates meeting at a triple junction - in the Balkans. Recent History. Richard Maybury 1 provides the following concise sketch of recent events that seem to be leading to the inevitable crisis. "When the Soviet Empire broke up a decade ago, the Bush administration became the only surviving superpower. Bush issued the decree that borders should not be changed. "The Serbs [Eastern Orthodox Christians] quite reasonably took the Bush decree as permission and encouragement to stop Slovenia (Catholic), Croatia (Catholic), Bosnia (mixed), and Kosovo (Moslem) from splitting off from Yugoslavia. Result, five wars. "Bush and Clinton first intervened on the side of the Catholics, so Slovenia and Croatia succeeded in splitting off. In recent years, the Catholics have been out of the fight. "Enemies since the Middle Ages, the dominant Serbs treat Moslems none too kindly. And, vice versa. For years the Moslems have been retaliating against Serb oppression by killing Serb policemen. "In 1998, the Serbs got fed up with the killings and began a crackdown. "Clinton sided with the Serbs (Eastern Orthodox Christians). He helped the UN impose an arms embargo, which hurt only Moslems because Serbs were already well armed. "With this US help, the Serbs got the upper hand. "Clinton then became distressed by Serb brutality, and switched sides. In March 1999, he began bombing Serbia. "Clinton threw the Serbs out of Kosovo and established Kosovo as a protected area for Moslems. "To no one's surprise... Moslem guerrillas now use Kosovo as a safe area from which to launch more attacks on Serbs and the Eastern Orthodox Christians in Macedonia. "Each ethnic group is just a subgroup of the three main religious groups. All Washington is doing is lurching from one battlefield to the next in the same ancient religious war, taking sides with whichever subgroup happens to be losing at the moment." The Fuse. Macedonia is widely believed to be the fuse that will light a Balkan religious war. For, as stated in The Economist for March 17, 2001, "Compared with other Balkan crises that have simmered, and boiled over in recent years, Macedonia's is potentially even more serious... The nightmare... is that war in Macedonia could eventually drag in Greece and Turkey, two Nato members, on opposite sides." The Greek-Turk feud is one of the oldest on Earth, and a reminder of how vicious strife between religious cultures can be. The Turks are Moslems, and the Greeks are Eastern Orthodox Christians. Washington and Bulgaria have backed the Christians, against the Moslems, in Macedonia. Current fighting in Macedonia gives the Greeks cover to invade and annex Macedonia. 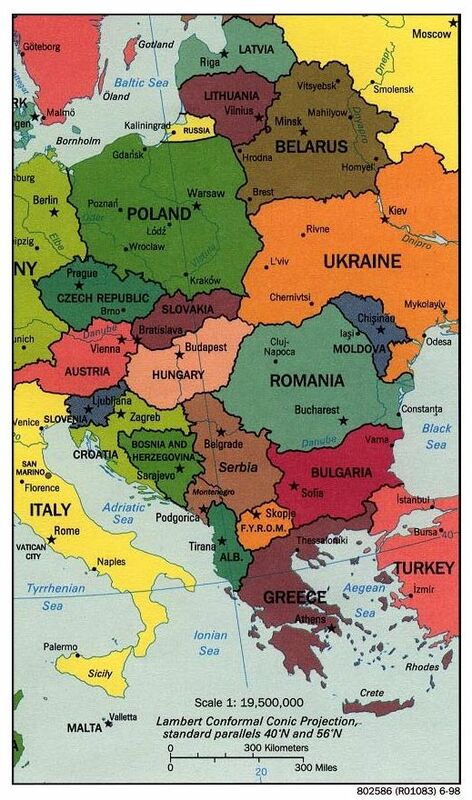 But if that happens, Turkey, also an old enemy of Bulgaria, would probably move into Macedonia to protect the Moslems there. "WASHINGTON -- 'The United States plans to give several Middle East nations hundreds of millions of dollars in free weapons but is demanding greater accountability from Washington's allies. 'Last week, the House of Representatives overwhelmingly approved the Security Assistance Act of 2000, which provides millions in foreign military aid and training to developing nations. They include Greece, Turkey, Egypt and Israel. 'The Pentagon plans to deliver three surplus Knox-class naval frigates to Greece. Turkey will be allowed to lease two Oliver Hazard Perry class guided missile frigates. Ankara will have an option to buy the vessels. [Emphasis added]. 'The biggest recipients of U.S. aid are again Israel and Egypt. Israel will receive more than $1.9 billion in 2001 and Egypt will receive $1.3 billion in each of the next two fiscal years. 'Congress has also allocated more money for International Military Education and Training. In 2001, the United States will fund its allies $55 million and the following year $65 million for military training. 'The House bill is the first in 15 years that authorizes military aid. Arms control experts called the bill a step forward because of its provisions for greater transparency and accountability for U.S. arms exports. 'These include a requirement that any U.S. ally must have similar defense export laws to that of Washington before it is granted license exemptions for unclassified arms transfers. Congress also directed the State Department to include commercial weapons delivery data in the annual report that details U.S. arms transfers to foreign countries." What are the Eastern Orthodox Christians ("Serbs") Thinking Now? Serbia has become the poorest country in Europe in the aftermath of the NATO bombing campaign. The U.N. and NATO have run Kosovo, a province of Serbia, since 1999. Tens of thousands of Serbs, fearful of revenge attacks, have fled Kosovo since 1999. Now, for the first time in their history, the people of Kosovo will have a chance to decide day-to-day affairs. On November 17, they will vote for a president, prime minister, and a 120 member Assembly. Ten seats are reserved for Kosovo's Serbs. Will Serbs participate in the elections? Will they accept the results? But when he met with Archbishop Christodoulos, the pope "asked pardon for the pillaging of Orthodox Constantinople by medieval crusaders in 1204 and for all other 'occasions past and present, when son and daughters of the Catholic Church have sinned by action or omission' against Orthodox Christians." At the end of the pontiff's visit, Christodoulos declared it "the beginning of a new era." Hopefully, the Croats and Serbs of the Balkans will be inspired by the words of their religious leaders to likewise forgive each other. But don't hold your breath waiting for peace to break out, for Christodoulos also said, "The time has come for us to coordinate our efforts to assure that Europe remains a Christian land." Presumably, he has in mind that the two churches would unite now against non-Christians. These non-Christians would be Moslems, especially Turks. Conclusion. Although a compelling case can be made for a religious war centered in the Balkans, we should now consider our second choice for the event - the Middle East. Indeed, it is here that the main protagonists, the Palestinians and the Israelis, may be said to already be at war. Background. 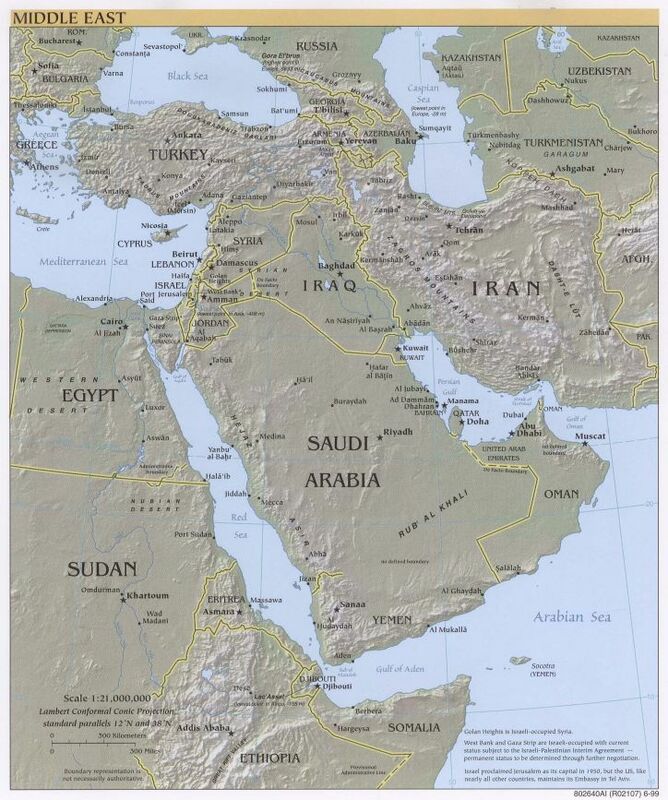 - Numerous events point to a major Middle East religious war erupting in the very near future. By mid-January of 2001, Israel had told its citizens to prepare for a real war and had asked for a call-up of all reserves. Arab States had entered into a mutual defense pact. Palestinian/Israeli/Arab relations were at the lowest point since the Six Day War. The economy was in trouble with a recession predicted. Finally, the US military was gearing up for a war in the Middle East. All US forces in Europe and the Middle East had been placed on alert, and Patriot Missiles had been readied for deployment to Israel. By mid-February, the Islamic opposition to Palestinian Authority Chairman, Yasser Arafat, had threatened to continue a bombing campaign against Israel. The Iranian-backed Islamic Jihad warned that its "holy war" against Israel would never stop and was meant to create terror in the Jewish state. The Jihad said this would be a Palestinian response to the election of Ariel Sharon as Israel's new prime minister. "The choice of holy war will never stop," Islamic Jihad leader Abdullah Shami said. "The choice of carrying out explosive attacks in the heart of the enemy will continue, not only within the 1967 lands, but in all of Palestine, from the Nile to the sea and from the north to the south. We confirm that the bombing missions will continue to create a balance of terror. The destruction of the enemy's cities and villages and the killing of settlers is the choice. So, be ready, Sharon." Syria had called for a renewal of the Arab boycott against Israel in wake of Sharon's election as prime minister. And Syrian Foreign Minister Farouk A-Shaara had called Sharon a threat to regional security. Arnaud de Borchgrave discussed the tilt toward war in the Middle East on May 4 in the following piece (quoted, in part, from a UPI source). "It started with stones, and Palestinian mortar barrages are now commonplace. The drift toward another war is unmistakable. "The Palestinians have concluded that an independent state in the West Bank and Gaza is a mirage that barely shimmers on the horizon. Iraqi agents are telling their Palestinian interlocutors that they are now like the French resistance fighting Nazi occupation in World War II and that total liberation should now be the objective. "Hamas' suicide bombers are parading openly in Gaza with dummy explosives strapped to their waists. Hamas leader Sheikh Ahmed Yassin appears regularly on the Arab world's top-rated television network, Al Jazeera, to say that the destruction of the Israeli state must be the objective of all Arabs. "Moderate Arab governments -- primarily Egypt and Jordan, the only two that have signed peace treaties with Israel -- are still sticking their necks out for negotiations and a peaceful settlement. They both know that the streets of their capitals favor Iraq's Saddam Hussein over their own leaders, and if the region explodes public opinion would insist they join the fray. "Hedging its bets, Saudi Arabia signed in mid-April a security cooperation pact with Iran. Iranian President Mohammed Khatami on a recent visit to Moscow signed an expanded strategic cooperation pact with Russia that calls for the transfer of Russian ballistic missile technology. North Korea is also supplying missile components to Iran. "Iran, not an Arab nation, is doing plenty. It has supplied Hezbollah with scores -- Israeli intelligence believes hundreds -- of short-range missiles (40 miles) that are fitted with conventional explosives. But these could easily be converted to chemical or biological agents. "In an interview with the German weekly Der Spiegel in late April, Egypt's President Hosni Mubarak seemed reconciled to another war to clear the air, much the way his predecessor Anwar Sadat advocated 'shock therapy' for the region six months before the October 1973 Yom Kippur War. "'If the talks really turned to war, the Americans would get involved and prevent an all-out war from happening,' Mubarak said. 'Yet as bad as war is, at least you know what you are dealing with. Worse than open war is this terror, which can strike anywhere and at any time.'" "DEBKAfile's intelligence sources report an ominous development in Central Asia. According to DEBKA, under Russia leadership, the newly independent republics of Central Asia (Kazakhstan, Kyrgyzstan and Tajikistan, Uzbekistan) AND CHINA are assembling a military force, gathering themselves for one of the greatest battles the region has ever faced against militant Islamic forces in the area. "Purportedly, the objective is to form a Central Asian military to function as a rapid-reaction collective security force against international terrorism. Collectively, the initial deployment will be approximately 15,000 men comprising four battalions and including the Russian 201st Motorized Rifle Division already stationed in Tajikistan. The 201st Division will spearhead the combined force of tank units, light tanks for mountain warfare, helicopter airborne units and elite forces trained in combat in built-up areas. "Of note is that this is the first time Chinese military personnel were allowed by Moscow to be stationed openly in the Central Asian republics of the former USSR. This underscores the growing military alliance between Russia and China that was birthed out of mutual desire to counter what they consider growing imperialistic tendencies on the part of the United States. "Although the stated purpose of this rapid deployment force is targeted at radical Muslim elements that embrace international terrorism, it should be noted that Russia has been negotiating with Iran for quite some time -- exchanging nuclear technology and weapons for both Iran's silence in the Chechnya affair (the Chechnyians are Muslim) and to prevent radical Muslim agitation in the southern republics of Kazakhstan, Turkmenistan, Tadzhikistan, Uzbekistan, and Kyrgyztan. The Caucasus Mountain region is comprised of the following nations: Ukraine, Belarus, Kazakhstan, Kyrgyzstan (formerly Kirgizia), Tajikistan (Tadzhikistan), Turkmenistan, Uzbekistan, Georgia, Armenia, Azerbaijan and Moldavia. "The DEBKA report is especially interesting when one considers that these same nations are some of the nations expected to join with Russia, Turkey, Libya, Ethiopia and Iran in the attack against Israel during the Gog and Magog War -- predicted in chapters 38 and 39 of the prophet Ezekiel. "It becomes even more relevant when one recognizes the area of Chechnya is located just north of the Caucasus mountains in the Russian republic of Georgia [see map], biblically known as Magog. 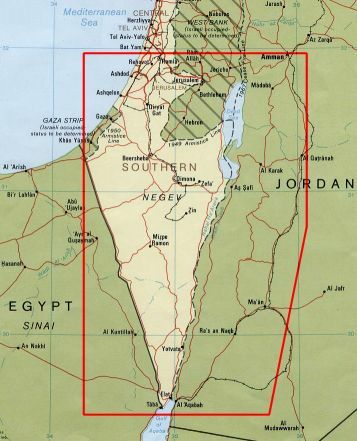 In light of this new military escalation in the area, it appears that the ongoing, dragged out Chechnyian affair (which has allowed Moscow to maintain a burgeoning military presence just 900 miles north of Israel), may have just been phase 1 in the possible staging for the invasion of Israel). Isn't it strange how Russia just can't seem to contain the poorly-armed and poorly-trained Muslim insurgents in the area which has justified the continued build-up in the area. "Russia already is now joining with China (a major participant on the battle of Armageddon) and the Central Asian republics (area of Magog) to increase the size of that force. In light of the Russian-Iran alliance, however, it may be that this new Central Asian military rapid-reaction security force to be deployed against radical Muslim insurgents may be a ploy -- and in fact may be phase two in preparations for a military strike against Israel. "Lending credence to this scenario is that fact that in February, UPI reported that a senior Russian military officer indicated that Russia and Iran continued to hold military talks in Moscow to discuss security issues and closer military ties between the two countries The official agenda was to include talks on regional security, the Middle East peace process and the situation in war-torn Afghanistan. It appears that this may also be a smokescreen and the real objective is Israel -- just as foretold by Ezekiel. "So the Russian army contingent is growing and is now located in strategic proximity to the countries with whom she will ally in the attempt to destroy Israel. To the west and southwest of Chechnya lie Turkey and Armenia -- the House of Togarmah. To the south, en route to Israel, lie Iraq and Iran (Persia). Chechnya is also close to Russia's Black Sea naval facilities, which would be key to quick deployment to the south and to the west. "Gomer and all his bands are also part of the Israeli invasion force. Gomer was an immediate descendant of Noah who settled north of the Black Sea and then migrated westward into what is today Eastern Germany and Poland. So Israel will be hemmed in by the Mediterranean on the West, on the east by Iran and Iraq, to the north by Syria and Turkey. Ethiopia and Libya to the south will complete the invasion force, making Israeli escape an impossibility. "As has been discussed in past analysis, the Israeli-Turkish alliance is critical to preventing a Middle-East War. Israel and Turkey signed a military pact in 1996 that reversed years of frosty ties, but Turkey has begun to waver on support to the U.S.A., as well as to Israel. Turkey is an ally of both the United States and Israel, but Turkey's close ties with Israel included military agreements and military cooperation such as in the recent Air force maneuvers using F15 and F16 fighter jets. But that may be changing. Turkish Prime Minister Bulent Ecevit said after talks with Yasser Arafat last fall indicated he supported the principle of Palestinian statehood. But was even more disturbing was that Arafat pointed out that Turkish soldiers are in the West Bank city of Hebron assisting a Palestinian army unit. "Turkey is an important regional power and it is continuing to move toward the Arab world. President Suleyman Demirel visited Egypt last year with hopes increasing economic cooperation and to consolidate already close political ties with Cairo. King Abdullah of Jordan also said during a visit last year to Amman that Turkey should play an important role in middle eastern peace making: 'Changes in the region dictate that our relations with Turkey assume a strategic dimension which we hope will set an example for Arab-Turkish ties.' Of particular note was Intelligence Digest's observation at that time that 'Syria cannot possibly go to war with Israel until Turkey is neutralized.' In their eyes, Turkey is the lynchpin to stability in the area. "Then on April 19, 2001, in a move which would have been considered out of the realm of possibility only a year ago, it was announced that Syria and Turkey are exploring the prospect of military cooperation. The Damascus-based Syrian News Agency, SANA, said the talks concerned 'means of developing cooperation between the two armies.' Turkish Foreign Ministry officials said Ankara and Damascus are discussing a framework for military cooperation that would include mutual visits by commanders, joint training and invitations to exercises. They said the issue was first explored during a visit by a Syrian military delegation to Ankara in January. Officials said Turkey has even proposed to Syria projects to jointly develop defensive systems that would increase border surveillance. They said the Foreign Ministry in Ankara has taken the lead in a Turkish effort to improve relations with the Arab world, including Iraq and Syria. "It appears that Turkey is starting to ally herself with Israel's enemies exactly as prophesied by Ezekiel. "The Kings of the East are also rising just as Biblical prophecy indicated. China, which at the time of the end will march into the Middle East with a 200 million-man army, is also starting to flex its military muscles. In fact, two war simulations done between the USA and China shows the USA losing, as they are eventually overwhelmed due to the sheer volume of China's weaponry and manpower. China has been moving closer to war with Taiwan and has recently moved missiles closer to the Taiwan theatre. China possesses long-range nuclear missiles that are capable of reaching the West coast of the U.S. and they have threatened to nuke the U.S. Navy in the Taiwan straits if they get in the way of their ambitions for Taiwan and just last year they threatened to nuke Los Angeles. China and Russia have become allies against the United States. "In what is certainly to inflame China and Russia, with whom relations are already strained over events of recent days, USA Today; reported on May 2, 2001 that President Bush has vowed to go ahead with the U.S. anti-missile defense initiative even if it does mean antagonizing Russia and China and violating the 1972 ABM treaty which Bush said represents the past and had been signed with the now defunct Soviet Union. President Bush called for a 'new framework;' of defense that recognizes the cold war. If President Bush were able to obtain approvals to pursue this plan, it would not be before approximately 2006 that the technology could be deployed. This frames a window of opportunity for our enemies to exploit the weakest modern-day U.S. military since the cold war supposedly ended. "We do know that in the fullness of time that it will be God who will draw Magog into this ill-fated invasion of Israel by 'putting hooks in their jaw.'. It appears that the Russian bear is in position for its final plunge south toward Israel and the riches of the Middle East. "The powder keg in the Middle East could ignite WWIII and the time is running short. What we are observing may indeed be the initial staging for a move against Israel and the oil-rich Middle East. Russia is probing America's defenses. China recently warned the U.S. that if they send a carrier group into the area to defend Taiwan, that it would nuked. China is getting more and more belligerent and is threatening to pull the U.S. into a conflict over Taiwan while at the same time pursuing an aggressive military build-up. "For example, Russia has developed new submarine-launched 'ultrahigh-speed torpedo' known as the 'Shkva,' against which there is no current defense. This technology is based on a phenomenon known as supercavitation that allows naval weapons and vessels to travel submerged at several hundreds of miles per hour. In comparison, current undersea technologies is limited to a maximum of about 80 mph. "Richard Fisher, a defense analyst and senior fellow at the Jamestown Foundation, stated that: 'China purchased the Shkval rocket torpedo. The Shkval was designed to give Soviet subs with less capable sonar the ability to kill U.S. submarines before U.S. wire-guided anti-sub torpedoes could reach their target. The Chinese navy would certainly want to have this kind of advantage over U.S. subs in the future. At the speed that it travels, the Shkval could literally punch a hole in most U.S. ships, with little need for an explosive warhead. This torpedo travels at a speed of 200 knots, or five to six times the speed of a normal torpedo, and is especially suited for attacking large ships such as aircraft carriers;' stated Fisher. "The report that China purchased some 40 Shkval torpedoes from Russia in 1998 has been confirmed by U.S. intelligence sources. There are no evident countermeasures to the Shkval and, according to weapons experts, its deployment by Russian and Chinese naval forces has placed the U.S. Navy at a considerable disadvantage. "God tells us, through Ezekiel, that at the time God moves to protect Israel by destroying the Israel invasion force, that He will also judge another nation that lives in the safety of the far distant coastlands. "I [author of this DEBKA report] personally believe that America is at great risk as she has spilt the blood of 45 million babies and that blood is crying out to God for vengeance. (Vengeance is the Lord's). "Unless the sin of abortion is dealt with in America, it is just a matter of time until God will call for repentance in the midst of destruction." Pardon our use of the above anti-abortion-judgmental, Israel-leaning DEBKAfile report. We used it only because DEBKA's intelligence sources are known to be good and usually reliable. It's true, also, that there is an overprint of biblical prophecy in some of the prose produced. Note, for example, that the report speaks of judgment for America in moralistic/biblical terms, and raises the destruction of human life by abortion as a reason for God to judge America. But could not God instead judge America -- as presumably being the nation "living in the safety of far distant coastlands" -- for its militaristic support of the various participants in the ultimate Middle Eastern conflict? And if God does move to protect Israel "by destroying the Israel invasion force," perhaps He will do so through the readings'-predicted pole shift and related Earth changes. But before entertaining that subject, let's consider just what causes wars in the first place. "Yes. But Man must change himself so that certain vibrations do not make him violent. Wars are not caused by Man. The sources are extra-terrestrial - such as two planets crossing each other and causing a tension, a certain vibration. Mechanical mankind translates this vibration into violent emotions and so war results. If Man became more conscious, he might, instead, receive energy in the form of increased consciousness from these vibrations." "Somewhere up there two or three planets have approached too near to each other; tension results. Have you noticed how, if a man passes quite close to you on a narrow pavement, you become all tense? The same tension takes place between planets. For them it lasts perhaps a second or two. But here on earth, people begin to slaughter one another, and they go on slaughtering maybe for several years. It seems to them at the time that they hate one another; or perhaps that they have to slaughter each other for some exalted purpose; or that they must defend somebody or something and that it is a very noble thing to do; or something else of that kind. They fail to realize to what an extent they are mere pawns in the game. They think that they can decide something; they think that they can move about as they like; they think that they can do this or that. But in reality, all their movements, all their actions, are the result of planetary influences. And they themselves signify little or nothing... Everything that happens on a big scale is governed from outside, and governed either by accidental combinations of influences or by general cosmic laws." In May of 1938, as World War II loomed on the horizon, Mr. 1598-2 asked about the possibility for war and for the drawing of America into the battle. Q What is the outlook for world war? Will it arise over Czechoslovakia, China, or Spain? and what will America do? A These are large questions, asked in an easy manner! As we have indicated, America MUST pray more and act like it prays; or else be drawn into that which has been indicated (through this channel) would cause civilization to move - ever - westward. The turmoils over Czechoslovakia are gradually being disseminated - but there will be portions, of course, that will be absorbed by the German influence. Q Will America be drawn into the coming war? That depends upon that just indicated. If America acts AS it prays, no! If it acts in one manner and prays in another, or if there is allowed to be the ruling of those who seek for greater aggrandizement or the fulfilling of self's own desires, then it will be eventually drawn into war. Once Begun, Might Not Pole Shift Mitigate The Coming Religious War? If current tendencies and outright strife in the Balkans and Middle East continue to increase, the world might well expect an outbreak of religious war this year. Only a trigger - possibly due to extra-terrestrial causes - seems necessary to ignite the conflagration. But if pole shift and Earth changes also begin this year, might we not expect that these geophysical events could bring a quick reduction in the slaughter? How might such occur? Realize first that only a pole shift can supply the energy required to produce the many catastrophic Earth changes mentioned in the Cayce readings. As soon as the shift begins, large areas of the Earth's crust will be raised, lowered, or otherwise "broken up." Volcanoes will pour ash into the sky, limiting sunlight, cooling the climate, and inducing crop failures. Reading 3976-15 states, "...as has been given of old, the sun will be darkened and the earth shall be broken up in diverse places." Those places already poised for crustal disturbance may suffer the greatest changes, or the greatest "breaking up." Such places as the Balkans and the Middle Eastern nations. Strifes will arise throughout the period. Watch for them near Davis Strait in the attempts there for the keeping of the lifeline to a land open. Watch for them in Libya and in Egypt, in Ankara and in Syria, through the straits about those areas above Australia, in the Indian Ocean and the Persian Gulf. Ye say that these are of the sea: yes -- for there shall the breaking up be...."
Ankara, the capital of Turkey, is a city of 2.7 million souls that lies in the central part of the country. Having no boundary with a sea, Ankara, capital of Turkey seems not to be "of the sea," and so the "Ankara" of the reading stands for Turkey. Turkey lies between the Black and the Mediterranean seas. Thus, at some point Turkey will be broken up. 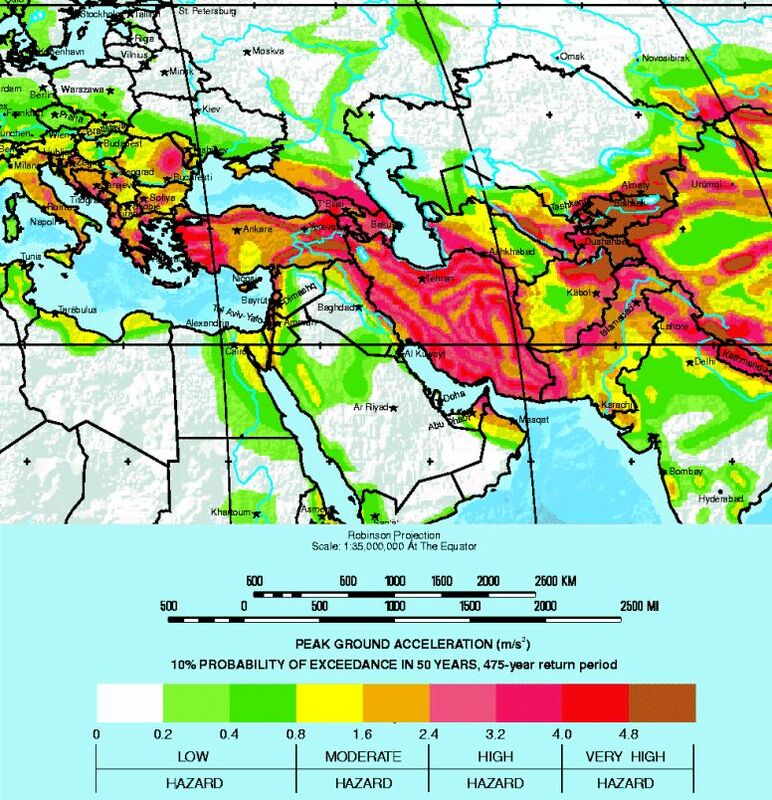 The seismic hazard map above shows the current risk levels for earthquakes (and by inference for crustal breakup) in the Balkan and Middle East regions. We have already documented the tragic results of major quakes and crustal movements in August and November 1999, along the North Anatolian fault in northwestern Turkey. Geologists will say that such quakes were nothing out of the ordinary. Indeed, they were expected. We say, yes, but they also may represent the beginning of the break-up of "Ankara." (The fault lies within the deep-brown, thin E-W pattern crossing northern Turkey (see map). For further insight into the very real possibilities for crustal break up in the lands bordering the Mediterranean and Black seas, consider this story about how ancient, eastern Mediterranean civilizations may have come to an end around 1200 BC. It comes from Stanford Professor of Geophysics, A. Nur. As presented by L. Bergeron in the New Scientist (12/27/97), Nur found evidence of strong earthquake damage in collapsed buildings at about a dozen archaeology digs. Intrigued, he compared the locations of 47 ancient cities that were destroyed against maps of earthquake epicenters for the last 80 years. "Almost all the cities were in areas that today suffer the most intense seismic shaking, suggesting that violent earthquakes were to blame." Nur believes that roughly every 400 years intense earthquake storms activate a maze of faults and small lithospheric plates in the region. He told a meeting of geoscientists that there was a thirty-year earthquake storm along the North Anatolian fault in northern Turkey in the last century. Some quake magnitudes reached 7.0 to 7.5. Other such "storms" occurred in the 8th and 15th centuries. Thus Turkey, and other countries bordering the Mediterranean and Black seas, seem destined to break up when the Earth changes begin. And Iran and Abu Dhabi, bordering on the Persian Gulf, are also subject to intense shaking and tectonic movements. For geophysical reasons alone, all of these countries are already part of a highly faulted and/or strongly seismic piece of the world. ...what is now the coast line of many a land will be the bed of the ocean. Even many of the battle fields of the present [August, 1941] will be ocean, will be the seas, the bays, the lands over which the NEW order will carry on their trade as one with another. Great Earthquakes. If pole shift is proceeding apace later this year (reading 826-8), we can expect great earthquakes in seismically sensitive areas of Earth's crust. The Cayce readings do not predict specific dates for great earthquakes or specific Earth changes. Interestingly, however, there is a reading that says that such are due and will occur, but that -- at the time the reading was given -- dates and times of future changes could not yet be made. Q. When is this [change in the Earth's surface in the Mediterranean area that will stop Italy's campaign against Ethiopia] likely to occur? A. As to times and places and seasons, as it has indeed been indicated in the greater relationships that have been established by the prophets and sages of old -- and especially as given by Him, "As to the day and the hour, who knoweth? NO ONE, save the Creative Forces." Great Earthquake Predicted For Armageddon (Megiddo), Israel: Shifting for a moment to the New Testament, the Book of Revelation (Ch. 16, v.16-18) contains a prophecy of a battle and great earthquake at Armageddon at the end of time. Armageddon is a corruption of Har Megiddo, or Mount of Megiddo. And he gathered them together into a place called in the Hebrew tongue Armageddon . Now near Megiddo, Israel operates Ramat David, an important Air Force base in the north of the country that faces Syria. 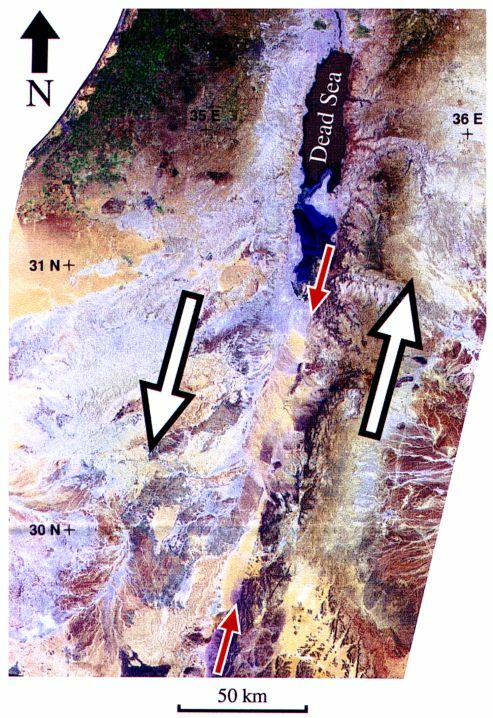 Professor Nur said in July 1997, that a major earthquake would someday strike Megiddo. The town was struck by three major quakes between 1550 and 1000 B. C. Nur compares geologic conditions in the vicinity of the Dead Sea rift (see map) to those near the San Andreas fault in California. This rift marks a left-lateral strike-slip fault that accommodates the relative motion between the African and Arabian lithospheric plates. Displacement between the two plates measures around 65 miles. Studies demonstrate that many damaging quakes have occurred along the fault and that it poses a considerable hazard to Israel, Jordan, and the Palestinian Territories. A great (M8.0+) earthquake along this fault would affect significantly the progress of any high-tech war being fought in this region of the Middle East. Pole shift this year would certainly generate such a quake. From Fig. 1 of K. Abu-Ayyas, And Others, 2000, EOS, v. 81. no. 5, p. 609. Q Regarding the general world conditions, is it likely that changes in the Earth's surface in the Mediterranean area will stop Italy's campaign against Ethiopia? A Not at this particular period. This may eventually be a portion of the experience, but not just yet. Q When is this likely to occur? A As to times and places and seasons, as it has indeed been indicated in the greater relationships that have been established by the prophets and sages of old — and especially as given by Him, "As to the day and the hour, who knoweth? No one, save the Creative Forces." So here we have it. Disregard the laws of divine influence and expect chaos and destructive forces -- perhaps even Earth changes -- in our lives. Conversely, comply with divine law and help bring order out of the chaos around us. But -- and here lies the rub -- just how do we attain the ability to comply with divine law? It is said that there are 77 ways of spiritual attainment open to souls on Earth. One of the beauties of the Cayce readings on personal soul growth was their ability to provide guidance to each individual, according to his or her level of understanding. But the source of the information that was available then, through Cayce, is not available today. We await, therefore, with great expectation the return of the High Souls and their associates mentioned in chapter 10 of CEC. For it is possible for one to attain only under the guidance of a soul who has already successfully trod the path. Reading 3976-15 speaks of the "spirits of light that come into the earth for this [Aquarian Age] awakening; that have been and are being called by those of the sons of men [us!] into the service of the living God." The best we can do at present seems to be "to prepare to prepare" for meaningful study in the New Age. And, certainly, we should pray for divine guidance in our daily lives - and endeavor to live the guidance received. Our conjectures (above) about the coming religious war beginning in either the Balkans or the Middle East have been trumped by the outbreak of hostilities in Afghanistan. Wars never seem to start according to reasonable hypotheses, however logically these hypotheses may have been conceived. We continue to believe, however, that this new war will be cut short by the Creative Forces due to the growing propensity of today's warriors to employ nuclear weapons. Pole shift and Earth changes will be the agents that will terminate the war, before the Earth and humanity are themselves terminated. Are we now in a religious war? How do we decide? The following article was written by an historian5 familiar with the centuries-long struggle between Christianity and Islam. It explains why the hot war that started with the terrorist acts of September 11, 2001, against the U.S.A. is merely another chapter in the on-again, off-again religious war between the two religions. The United States is at war. The President has told us that it will not be a short war. So has the Secretary of Defense. There is no narrowly defined enemy in this war. There is no nation with which to conclude a peace treaty. There are now multiple invisible enemies who share a common faith: Islam. The pool of potential volunteers from which our enemies will be able to recruit now approaches half a billion men, and is growing. This war is merely the latest skirmish in the oldest war in the West. It is a religious war. [Emphasis added]. Arabs crossed the straights of Gibraltar and invaded Spain in the year 711. They had conquered Spain by 719. In 732, having crossed the Pyrenees, they fought Charles Martel ("The Hammer") at Tours (Poitiers). They were defeated. Martel beat them again five years later at Narbonne. The Spanish then spent over seven centuries in a war to remove the Moors from their soil. Success finally came in 1492. So, for seven hundred and eighty years, there was war in Spain -- not constant battles, of course, but a constant dedication to defeat the Moors. Our leaders have no idea how long this war can go on. We can be sure of one thing: it will go on longer than they presently imagine. Islam has never surrendered. According to historian Paul Johnson, if present birth rates remain the same, both Italy and Spain will be predominantly Muslim before the year 2100. Johnson's essay is very significant. Arab expansion was replaced by the expansion of the Ottoman Turks, beginning in the late thirteenth century. They conquered Constantinople in 1453. They got to the gates of Vienna in 1529 and again in 1683. It took a battle in both cases to throw them back. In 1915-16, the Turks, under the secular ruler Kemal Ataturk, killed at least one million Armenians in the first genocide of that century. There was no meaningful protest from any of the European powers, who were at war with each other. They were too busy to care. They still are. That event was within the lifetime of people who are still alive. Today, there are over two million Turks in Germany, three million in all of Europe, up from two million in 1985. There is no way economically that Germany can expel Turkish workers. The Turks are too important for the German economy. The declining birth rate of Germans requires an infusion of younger non-German workers who will pay the government's promised retirement subsidies. Turkey may gain membership in the European Union in 2004. That would mean open borders for Turks. Europe's unconventional war is primarily demographic and economic. The Europeans are rapidly losing. Year by year, Europe is falling to Islam. An invasion that began in the early eighth century will be irreversible by the early twenty-second century. Muslims are patient. They do not need to fire a shot. They merely reproduce at rates above the replacement rate of 2.1 children per family, a rate which no white, formerly Christian nation's population presently enjoys. This war is also military. It always has been. Yesterday, I came across a remarkably frank Web site, run by an Islamic group, which went into great detail on the moral obligation of every Muslim make to gain military training. It called on Muslims to get legal military training in the nation in which they reside. I saved the link. No use. Today, this entire site is gone --suspended, the otherwise blank page says. [http://qoqaz.co.za] The site is gone; Islam's motivation is not. The President speaks of a full-scale war against terrorism: diplomatic, financial, and military. This is the strategy that Islam adopted two generations ago. The discovery of oil in Islamic lands after World War I re-kindled the war. What had not been either economically or militarily possible for Islam ever since the seventeenth century became possible again: the mobilization of forces against the West. Nevertheless, England and the United States triggered this phase of the war, especially from 1917 (the Balfour Declaration) to 1948, with the establishment of the State of Israel. (For those who want more background information on the establishment of the nation of Israel, they should locate copies of Alfred Lillienthal's books, WHAT PRICE ISRAEL, 1953; THERE GOES THE MIDDLE EAST, 1957; and THE ZIONIST CONNECTION, 1978.) This event was the fulfillment of the dream of secular Zionism, whose founder was Moses Hess, the revolutionary communist who brought Marx and Engels together in 1844. The secular West has not understood the multiple motivations of this conflict. It has not understood that the ancient war between Islam and Christianity is not over, nor is the war between Islamic supernaturalism and Western secularism, nor is the war between revolutionary secular Islamic politics and Western capitalism-imperialism. Ataturk was a secularist, a modernizer, but this did not stop his battle with the West at Gallipoli, which he won, or his battle against Armenian Christianity, which he came very close to winning. A decade ago, Francis Fukuyama wrote a widely heralded essay, "The End of History," in which he argued that Western democratic capitalism has won the war against all rivals. Today, a joint military campaign has begun, with Russian military socialists and Western military capitalists allied against a few thousand Islamic terrorists and their radical Koranic allies. The end of history? Not likely. Several Christians were arrested in Afghanistan a few weeks ago. They are charged with proselytizing for Christianity. This is a capital crime in Afghanistan, as it is in Saudi Arabia. They take their religion seriously over there. In 1991, the U.S. military sent down an order to all chaplains in Saudi Arabia: they had to remove their religious emblems from their uniforms. We were there to defend an Islamic nation from invasion by another Islamic nation, one run by a secular socialist whose government, until a few months earlier, had been the recipient of economic aid from the United States government. Our presence in Saudi Arabia is what motivated Osama Bin Laden to adopt a terrorist war against the United States. Eleven years ago this month (Oct. 1990), I signed an ad that was run on the Op-Ed page of the NEW YORK TIMES, pleading with the U.S. government not to get in a war with Iraq. Nobody paid attention to that ad except our critics. Now that military campaign has blown back, big time. This war is unlikely to stop. We have repeatedly jabbed a stick into a hornets' nest that appeared in 622. Our strategists are not prepared to deal with strategists who think in terms of centuries, let alone millennia. But from the Mexican War until the present, we have not been able to resist the temptation to grow larger at the expense of our perceived enemies. Today, we have a lot of them. They keep changing sides, or we do. We used Iraq to fight Iran. We used the Taliban to fight the USSR. We are now using the Russians to fight the Taliban. Round and round it goes, and where or when it will stop, nobody knows. Our secularist strategists cannot recognize a religious war when they see one. [Emphasis added]. They think of it as an aberration -- an aberration that is almost 14 centuries old. They think that diplomacy or foreign aid or another round of arms sales will overcome all resistance to the benevolent goals of an oil-based, central banking-based New World Order. They're wrong. Capitalism's division of labor has made everything cheaper, including weapons of mass destruction. This is now the biggest problem that Americans face. It is not going to go away soon. As an example of how a pole shift could quickly impact the activities of certain warring factions involved in the present religious war, consider the map below. The map shows the distribution of land and sea immediately after a one-degree shift of the north pole to 89.0°N, 60.0°W. Note that new land-sea boundaries reflect only the post-shift, sea-level geoid. Crustal elevation changes will also affect these boundaries, but such changes occur more slowly. There will be enough time - years to decades - before crustal movements catch up with the near instantaneous sea-level changes attendant to pole shift. Thus, there will be plenty of time for the initial flooding to have an enormous impact on nations' abilities to make war. Refer to our article, "Calibrating The Hutton Commentaries' Model For a 1° Pole Shift to 89.0°N" to understand our choice of 60°W for the shift meridian. The World Immediately After a One-Degree Shift of the North Pole to 89.0°N, 60.0°W. Make known the trouble ...WHERE IT LIES, and that THOSE WHO HAVE FORGOTTEN GOD MUST RIGHT ABOUT FACE! For He hath given: "Though the heavens and the Earth pass away, my word shall not pass away!" This is often considered just a beautiful saying, or a thought to awe those who have been stirred by some experience. But let us apply these words to conditions existent in the affairs of the world and universe at present. What holds them together - what are the foundations of the Earth? The word of the Lord! K. Gannon, Associated Press, 4/12/01). U.S. News & World Report, May 21, 2001. 1949, Harcourt, Brace and Co. NY; see page 24 re. the cause of wars.